Jovan REBULA (RSA) is the 2018 Amateur champion. He is the first South African winner since Bobby Cole in 1966 and can now look forward to playing in the 2018 Open Championship at Carnoustie Links, the 2019 Masters at Augusta National and the 2019 U.S. Open at Pebble Beach Golf Links. He beat Robin DAWSON, 22, (IRE) 3&2 in today’s 36 hole Final at Royal Aberdeen G.C. Following his win 20 year old Jovan spoke to The R&A: “It’s unreal. It’s really something that is hard to describe. I feel like many have been in this position before but its an unreal feeling. It hasn’t sunk in quite yet but hopefully tomorrow morning I can wake up and I will feel a little different. “I’m shattered. It’s been a long week and especially today. I should have finished maybe a couple of holes earlier, but it’s been awesome. A very tiring week. I’m standing here right now and there’s so much adrenaline pumping through me. It was cloudy with a modest north westerly breeze blowing when the morning round started at 8.30am; conditions which remained throughout the day, save for a slight increase in the wind speed later in the day. Here’s The R&A film of the opening tee shots. We are underway with @JovanRebula and @dawson_robin fighting it out for one of the biggest prizes in amateur golf. Both players made a steady start halving the first five holes. The South African then birdied 6 before being gifted 7 and 8 when Dawson bogeyed. The remainder of the morning round was up and down with Rebula eventually taking a 1-Up lead into lunch. A poor front nine in the afternoon round by Dawson allowed Rebula to extend his lead to 5-Up by the turn. Both players settled and halved the opening three holes of the back nine in par. Then the nerves seemed to kick in particularly for the South African whose mind may have started to wander given his strong position. Double bogeys on the 13th and 15th gave Dawson some encouragement. However, hopes of a big turnaround over the last few holes like last year were quickly extinguished on 16 when Rebula got up and down from a green side bunker to close out the match 3&2. Here are the full hole by hole scores from today’s Final. With Wilco NIENABER also winning the Stroke Play Qualifying the Championship proved to be a very successful one for the South African’s. It wasn’t long before his Uncle Ernie passed on his congratulations to Jovan too. Playing conditions proved to be far more amenable today. Whilst cloudy, with temperatures struggling to rise above 13°C, the north westerly wind was much more manageable at 15mph. Jovan REBULA (RSA) beat Mitch WAITE (ENG) 6&4. Waite has enjoyed a very good year and Championship but like compatriot Tom Sloman this morning was unable to find his game in this afternoon’s semi final. Rebula was again not made to work very hard for his victory. Rebula, the 20 year old nephew of Ernie Els, plays for Auburn University in Alabama and finished tied 21st in the NCAA Division I Men’s Championship in late May. He joined up with the South African touring party for the recent St. Andrews Links Trophy but missed the cut by 1-shot. Tomorrow he will play Robin DAWSON in the 36 hole Final over the Balgownie Links at Royal Aberdeen G.C., their match starting at 8.30am. Dawson was too good for Conor PURCELL this afternoon winning 3&2. Purcell handed Dawson the initiative with bogeys on the 1st and 3rd and despite fighting all the way to the end couldn’t get close to his fellow Irishman. Dropping very few shots in his two matches today Robin should go in to the Final with great confidence. The winner of the Irish Amateur in May is seemingly in complete control of his game. The Quarter Finals started at 8.15am with Tom SLOMAN (ENG) taking on Jovan REBULA (RSA) in Match 1. Unfortunately it proved to be a game too far for Sloman who will be disappointed that he didn’t make the South African work harder for his 2&1 victory. Neither player was at their best this morning in a poor quality affair. England’s other quarter finalist Mitch WAITE faired better beating Christoffer PÅLSSON (SWE) 3&2. As is becoming the norm for Waite it was far from straight forward. He was 3-Up after 7, before slipping to AS after 12 and then recovering to win comfortably on the 16th. Conor PURCELL recorded an eagle and 4 birdies in a great 3&2 win over David MICHELUZZI (AUS). Micheluzzi, the highest ranked player left in the field, was simply unable to live with the Irishman’s superb play in the middle of their match. In perhaps the highest quality Quarter Final Robin DAWSON overcame fellow Irishman John MURPHY 2&1. The Waterford man had the upper hand throughout but was certainly made to work hard for the win. It was a dry but cool day in Aberdeen, temperatures not rising much above 13°C. The wind was the big story. Like yesterday it was primarily from the north west but today it consistently blew at 25mph with occasional gusts reported of up to 45mph. This made playing conditions particularly challenging. With hole-by-hole scoring now available (click the score or result in the middle of each game to reveal) it was clear to see how tough the links played today. Round 4 proved to be the end of the line for Wilco NIENABER (RSA). In a tight match where neither player led by more than 1 hole Tom SLOMAN (ENG) was handed a 1-Up win when the 18 year old South African missed a relatively short par putt on the last hole. Fellow South African Jovan REBULA was behind for virtually all of his match before two bogeys on the last two holes by Ben HUTCHINSON ensured there would be Boks representation in the Quarter Finals. Rebula won by 1 hole. Match 3 arguably proved to be the most exciting in the last 16 with Bristol’s Mitch WAITE attempting to grasp defeat from the jaws of victory before thankfully saving the day against Timo VAHLENKAMP. As you can see from the scorecard below the German made a strong comeback over the last 8 holes but a three putt on the 19th meant it was all in vein. Christoffer PÅLSSON (SWE) again didn’t have to work very hard to progress. Luca FILIPPI (RSA) struggled this afternoon and easily fell to a 4&3 defeat. Conor PURCELL (IRE) was the first of three Irish to make the last 8 at The Amateur Championship. The Charlotte 49ers via Dublin golfer reeled off five birdies in 6 holes from the 11th to blow away Adam BLOMMÉ (SWE). Robin DAWSON was next up. He beat Elis SVÄRD 6&5 as the relatively inexperienced Swede finally bowed out having enjoyed a very good Championship. John MURPHY, who seems to have transformed himself into a world beater in the last two weeks, was the third Irishman to make it through to the Quarter Finals. He beat a clearly out of sorts Viktor HOVLAND (NOR) 6&5. There were a number of one sided matches this afternoon as perhaps the physical and mental exertions of the last four days started to affect some of the remaining competitors. In the other last 16 game David MICHELUZZI played well to beat Paul PEREDA (MEX) 5&4. The experienced Australian seems to be making very comfortable progress, largely under the radar, and must now be one of the favourites for the title. The highlight of this morning’s golf was the final match, played between relatively unknown Tom FORSTER (ENG) and WAGR Number 5 Viktor HOVLAND (NOR). Forster, who is studying in the USA at NCAA Division II college Carson-Newman, is clearly not a respecter of reputations as he gave Hovland, one of the star players at Oklahoma State, the 2018 NCAA Division I champions, a game to remember. As you can see from the above scoreboard Forster led 4-Up after 13 holes, Hovland in all kinds of trouble in the wind. Thankfully the Norwegian recovered his senses just in time and with a little help from an increasingly nervous Forster escaped with a 1 hole victory. Round 3 started at 7.30am with Wilco NIENABER (RSA) playing US-based Perry COHEN (SUI) in Match 1. The stroke play medalist started well and quickly built a 3-Up lead after 8 holes. However, some loose play around the turn and improvement by Cohen saw the match All Square with just the 18th to play. In the end a par down the last was good enough to secure the win for the South African protégé. Tom SLOMAN (ENG) enjoyed a tight match with Jeff WRIGHT (SCO). A bogey on the 17th by the battling Scotsman finally letting in the big man from Somerset, who would hold on down the last for a 1 hole win. Ben HUTCHINSON (ENG) overcame Rowan LESTER 2&1 in Match 3. The Irishman was leading 1-Up after 15 but sadly stumbled down the last 3 holes. Ben JONES (ENG) had an horrific start in his match and was quickly 5-Down to Timo VAHLENKAMP after just 7 holes. The German youngster ran out a surprisingly easy winner 7&5 in the end. Mitch WAITE (ENG) beat Stuart EASTON (SCO) by 1 hole in a rollercoaster match. Waite was 2-Up after 4 before then falling 3-Down after 11. Easton then lost his way, recording four bogeys in a row, allowing the man from Bristol to pull 1-Up after 15. Both players then steadied themselves before halving the last in double-bogey 6, Waite moving on. James SUGRUE (IRE) lost 3&2 to Christoffer PÅLSSON (SWE) in what appears to have been a poor quality Match 7. The Irishman bogeyed or failed to finish 11 of the 16 holes contested. Matthew JORDAN (ENG) looked comfortable early on against Conor PURCELL (IRE) but let things slip. Purcell, who plays out of Portmarnock, the 2019 host course, drew level after Jordan bogeyed the 18th and then completed the coup de grâce with a 40 foot chip in on their first extra hole. Scotland bowed out of the Championship later in the morning when their remaining player Sandy SCOTT lost 3&1 to Mexico’s Paul PEREDA. Match 13 saw Robin DAWSON (IRE) take on Spain’s Victor PASTOR. Dawson struggled on the front nine but played the back nine superbly in 3-under to run out the winner by 2 holes. In a very similar match Dawson’s compatriot John MURPHY played the back nine very well to overcome Lee WALKER (USA) 4&2 having earlier been 2-Down after 8 holes. Jovan REBULA (1 Hole) and Luca FILIPPI (4&3) were the winners in the two all-South African matches beating Malcolm MITCHELL and Therion NEL respectively. There were also wins for Adam BLOMMÉ (SWE), the ever impressive Australian David MICHELUZZI and giant killer Elis SVÄRD (SWE). At the end of the morning our 14 GB&I players had been reduced to just 6. Wilco NIENABER (RSA) started his Round 2 match against Niclas WEILAND at 9.15am. Showing no signs of faltering, as often happens with the medalist, he quickly despatched the Swede 5&4. Malcolm MITCHELL (RSA), David MICHELUZZI (AUS), Paul PEREDA (MEX) and Victor HOVLAND (NOR) are amongst the other highly ranked overseas players who are through to Round 3. However, it was a surprise to see Lorenzo SCALISE (ITA) lose, albeit he took Adam BLOMMÉ (SWE) to the 21st in the longest match of the Championship so far. GB&I contributed 26 players to the 64 that started Round 2. We finished the day down to 14. The Irish party are doing well. Rowan LESTER will be pleased with his performance; he beat fellow St. Andrews Trophy squad member David HAGUE (ENG) 6&5. James SUGRUE beat Australian Kyle MICHEL on the 19th hole whilst Conor PURCELL overcame Pablo RODRIGUEZ-TABERNERO TORRES (ESP) 2&1 to progress. Robin DAWSON took control of his match against David RAVETTO (FRA) from the start and ran out a comfortable 4&2 winner. Finally, John MURPHY made it 5 for the ‘Green Army’ coming from being behind early on to beat Oliver FARRELL (ENG) 4&2. Scotland have three representatives in Round 3. Jeff WRIGHT showed great determination to take out compatriot Euan MCINTOSH on their first extra hole; Euan having qualified strongly and played well for most of this match too. Stuart EASTON beat Australian Will HEFFERNAN by 1 hole before Sandy SCOTT took care of Claudio CONSOL (GER) 3&2. Of the 13 Round 1 winners just four could do the business again. One of these was Thomas FORSTER who surprised Daniel HILLIER (NZE) 2&1. The Englishman was joined by Tom SLOMAN, who beat Jediah MORGAN (AUS) by 1 hole, and Mitch WAITE, who enjoyed the biggest win of the afternoon, 6&4 against German Alexander HERRMANN. Wins for Ben HUTCHINSON, Ben JONES and Matthew JORDAN took the English qualifiers up to 6. Hutchinson beat Jamie LI (ENG) 5&3, Jones recorded a good 2 holes win against Matt SAULEZ (RSA) whilst Jordan ended up having to go to the 20th to finally despatch Finland’s battling Matias HONKALA. Game 1 of the Match Play Stage between Eetu ISOMETSÄ (FIN) and Robin WILLIAMS (ENG) teed off at Royal Aberdeen G.C. at 7.00am. It was raining, with a north westerly wind appearing for the first time. It was a game that Williams would disappointingly go on to lose 3&2. Of the 30 qualifying GB&I players 8 were required to play in this preliminary Round 1 which consisted of 13 matches. John PATERSON (SCO), Jack COPE (ENG), Oliver FARRELL (ENG) and Thomas FORSTER (ENG) were successful with the last three all requiring extra holes to overcome stubborn opponents. Cope ended up beating compatriot Max O’HAGAN, who had led for much of their match, on the 20th hole. Callan BARROW (ENG) lost 4&3 to Top 100 SPWAR ranked Mexican Paul PEREDA. Australia-based Scot Robbie MORRISON lost by 1 hole to experienced German Claudio CONSUL. The 13 winners of these Round 1 matches fed into the bottom of the Round 2 draw and would therefore be required to play again in the afternoon. The rest of the field will certainly have been pleased to see Takumi KANAYA (JAP), Alvaro ORTIZ (MEX) and Matias SANCHEZ (AUS) all surprisingly fall at this first step. 18 year old Wilco NIENABER (RSA) shot a 67 (-4) at Royal Aberdeen G.C. today to secure medalist honours at the 2018 Amateur Championship. His impressive 133 (-8) total included 11 birdies and just three bogeys. Two shots further back was Victor HOVLAND (NOR) who finished second in the stroke play qualifying on 135 (-6). Hovland shot a 65 (-5) at Murcar Links today, the best score on this course over the two days. Sam MEEK (CAN), who recorded rounds of 69 and 69 for a 138 (-3) total, finished third to claim the final stroke play qualifying prize. MATT SAULEZ (RSA) and Blake WINDRED (AUS) joined Wilco in shooting 67 at Royal Aberdeen today. This was the best score at the lead host course during the stroke play stage. Harry HALL (ENG) recorded a second successive 70 today to finish on 140 (-1). His tied 5th result was the best of all of the GB&I players in the field. Ben HUTCHINSON (ENG) Ev and Mitch WAITE (ENG) +1 finished 8th and tied 9th respectively. At the end of play the top 64 and ties match play cut fell at +6 with 77 players progressing. There were 30 GB&I qualifiers in total including 2018 winners John MURPHY (IRE) +2, Matthew JORDAN (ENG) +3, Robin DAWSON (IRE) +3 and Billy MCKENZIE (ENG) +4. With the wind dropping on Day 2 and the sun shining for the most part the scores were much improved. Murcar Links (par 70) saw it’s average score drop to 73.94 from yesterday’s 77.30 (-3.36) whilst Royal Aberdeen’s (par 71) fell from 76.86 to 73.98 (-2.88). Clearly those that played at the tougher Murcar Links yesterday had a slight disadvantage over the two days of qualifying. Amongst the leading players to miss out were Joe PAGDIN (ENG) +7, Dylan PERRY (AUS) +7, Andrew WILSON (ENG) +7, Calum FYFE (SCO) +8, Euan WALKER (SCO) +8, John AXELSON (DEN) +8, Angel HIDALGO (ESP) +8, Christo LAMPRECHT (RSA) +8, Clayton MANSFIELD (RSA) +9, Gian-Marco PETROZZI (ENG) +9, Sam LOCKE (SCO) +9, Nick POPPLETON (ENG) +9, Alex GLEESON (IRE) +10, Alex FITZPATRICK (ENG) +10, Jake BURNAGE (ENG) +11, Caolan RAFFERTY (IRE) +13, Bailey GILL (ENG) +14, Jamie STEWART (SCO) +16, Garrick HIGGO (RSA) +17, Todd CLEMENTS (ENG) +17 and John PAK (USA) +18. Wilco NIENABER (RSA) shot a 66 (-4) at Murcar Links to lead the 36 hole Stroke Play Qualifying after Round 1 of the 123rd Amateur Championship. David MICHELUZZI (AUS) and Sam MEEK (CAN) are second having both posted 69’s (-2), the best round of the day, at Royal Aberdeen G.C. Laird SHEPHERD (ENG) was the only GB&I player to post an under par score; his 69 (-1) at Murcar Links leaving him in tied 4th place. Euan MCINTOSH (SCO), who hit the first tee shot at Royal Aberdeen at 7.00am this morning, shot 71 (Ev) and finished the day tied 7th alongside Harry HALL (ENG) whose 70 (Ev) at Murcar Links looked like being much better for most of his round. On a windy but sunny day in Scotland the average score was higher at Murcar Links (77.30 / +7.30 in relation to par) than at Royal Aberdeen (76.86 / +5.86). After 18 holes there are 60 players on +3 or better, with a further 31 on +4, implying that the top 64 and ties cut will be around +7. The final stroke play round will start at 7.00am tomorrow morning with each competitor playing on the other host course. Unsurprisingly Chun An YU (CTP), who played the first two rounds of the U.S. Open at Shinnecock Hills, has withdrawn from this year’s Amateur Championship. Other late withdrawals include William BUHL (USA), Falko HANISCH (GER) – winner of the 2016 Boys’ Amateur Championship at Muirfield -, Noah COMBS (USA), Yuxin LIN (CHN), Zach MURRAY (AUS) and Raphael GEISSLER (GER). The 123rd Amateur Championship starts on Monday 18th June at Royal Aberdeen G.C. and Murcar Links G.C. in north east Scotland. The Amateur is the most prestigious amateur golf event played outside of the United States and without question the highlight of the Great British and Irish (GB&I) amateur season. 288 players will play two stroke play qualifying rounds, one round on each course, on Monday 18th and Tuesday 19th June. As in previous years tee times will commence at 7.00am and end at 3.52pm on both days. The 64 players with the lowest 36 hole scores, and ties for 64th place, will advance to the match play stage and be seeded in line with their qualifying finishes. The match play games will be played solely at Royal Aberdeen between Wednesday 20th and Saturday 23rd June. Matches will be played over 18 holes except for Saturday’s Final which will be over 36 holes. The 288 players are drawn firstly from a number of exempt categories covering R&A and U.S.G.A. Championship performances and representative teams. Thereafter places are allocated to those players ranked 1st – 2,000th in the WAGR as at 16th May 2018 and, if required, by reference to exact handicaps. Players from 38 different countries will contest the 2018 Amateur Championship. Outside of the home nations the best represented countries are France (31 players), U.S.A. (23), Australia (20), Germany (14), Spain (13), Sweden (13), South Africa (10), The Netherlands (9) and Italy (8). Whilst there are a large number of Americans playing it sadly remains the case that the vast majority of their leading players continue to skip the Championship. It is a sad state of affairs that most of them prefer to play in the Northeast Amateur Invitational at Wannamoisett C.C. in Providence, Rhode island – an event that starts on Wednesday 20th June. Without their participation The Amateur will always lack a little something despite the Major exemptions on offer. The best American this year is John PAK (SPWAR 52). Harry ELLIS, the defending champion, has not entered the Championship. He has been playing in the U.S. Open Championship at Shinnecock Hills this week and is expected to turn pro immediately afterwards. Last year’s runner up Dylan PERRY (AUS) is back for another go at claiming the title that eluded him last year. KristofferREITAN (NOR) 40 and Ryan LUMSDEN (SCO) 51 had both entered the Championship but both withdrew when they qualified for the U.S. Open. Chun An YU (CTP) 28 is also currently playing in New York but remains entered. It will be interesting to see if he is at Murcar Links on Monday for his 1.02pm tee time. Good on him if he is. Looking at the the current SPWAR top 50 the leading players, in addition to Yu, competing are Viktor HOVLAND (NOR) 9, Matthew JORDAN (ENG) 12, Christo LAMPRECHT (RSA) 17, Garrick HIGGO (RSA) 24, Wilco NIENABER (RSA) 26, Todd CLEMENTS (ENG) 27, Matt SAULEZ (RSA) 29, Lorenzo SCALISE (ITA) 31, David MICHELUZZI (AUS) 33, Joey SAVOIE (CAN) 37, Malcom MITCHELL (RSA) 42 and Alvaro ORTIZ (MEX) 45. From a GB&I perspective Robin DAWSON (IRE) 57, Jake BURNAGE (ENG) 67, Harry HALL (ENG) 68, Gian-Marco PETROZZI (ENG) 73, David HAGUE (ENG) T74, Alex GLEESON (IRE) T74, Caolan RAFFERTY (IRE) 91, Laird SHEPHERD (ENG) 95, Sandy SCOTT (SCO) 115, Ben JONES (ENG) 124, Andrew WILSON (ENG) 128, John MURPHY (IRE) 145, Bailey GILL (ENG) 177, Tom SLOMAN (ENG) 189 and Nick POPPLETON (ENG) 194 will all arrive with high hopes given their current good form. With the nine-man GB&I St. Andrews Trophy team due to be announced in mid-July a good Amateur Championship by any of the home players will undoubtedly resonate with the selectors. Finally, Spain’s Alejandro LARRAZABEL is an interesting entry. Alejandro won The Amateur in 2002 at Royal Porthcawl G.C. and has recently been reinstated to the amateur game. He will be the only past winner in the field. For the first time in it’s history the Amateur Championship is being staged at Royal Aberdeen and Murcar Links in Scotland. Royal Aberdeen was founded in 1780 and is the 6th oldest golf club in the world. Originally known as The Society of Golfers at Aberdeen the club’s name was changed in 1815 to Aberdeen Golf Club. In 1903 the ‘Royal’ title was conferred on the club by His Majesty King Edward VII. The club has hosted many prestigious championships, including seven Scottish Amateurs, two Boys’ Amateur Championships, the Boys’ Jacques Léglise Trophy and perhaps most memorably the 2011 Walker Cup, when GB&I defeated the United States by a single point. In 2005, it hosted the Senior Open which was won by five-time Open champion Tom Watson. In 2014, the Scottish Open was held there for the first time with Justin Rose coming out on top. The Balgownie Links at Royal Aberdeen is a classic links with the outgoing holes played through the undulating dunes on the coast before the return on an inland plateau with numerous blind shots and hidden ditches coming into play. Neighbouring Murcar Link’s was established in 1909 and lies to the north of the Royal Aberdeen course. Murcar hosted the inaugural Saltire Energy Paul Lawrie Match Play competition on the European Tour in 2016. Previously it had staged the European Girls Team Championship (2009), the Scottish Amateur Stroke Play (2009) and the European Boys Team Championship (2013). Mon 18th June – Sunny. Wind 17 mph SW. Temp. Max. 17°C / Min 7°C. Tue 19th June – Sunny. Wind 15mph SW. Temp. Max. 16°C / Min 10°C. Wed 20th June – Showers. Wind 11mph W. Temp. Max. 13°C / Min 8°C. Thu 21st June – Light Cloud. Wind 15mph NW. Temp. Max. 14°C / Min 9°C. Fri 22nd June – Light Cloud. Wind 10mph SW. Temp. Max. 14°C / Min 10°C. Sat 23rd June – Light Cloud. Wind 11mph SW. Temp. Max. 16°C / Min 11°C. Players will tee off throughout the day on Monday and Tuesday so changes in the weather and wind speed early in the week may impact the stroke play qualifying scoring. A momento is presented by The R&A to the players finishing 1st, 2nd and 3rd in the stroke play qualifying competition, with any ties determined by a second round count back. The winner of the match play stage will become the Champion Amateur Golfer for the year and is awarded the Championship Trophy and a Gold Medal. The runner-up receives a Silver Medal and each losing semi-finalist a Bronze Medal. The winner of The Amateur Championship will be exempt into next month’s 147th Open Championship down the coast at Carnoustie Golf Links. Traditionally, the champion is also invited to compete in the following year’s Masters Tournament at Augusta National G.C. Finally, they will also be exempt into the 2019 U.S. Open Championship which is being held at Pebble Beach Golf Links in California. England’s Harry ELLIS won the 2017 Amateur Championship on the 38th hole at Royal St. George’s G.C. 4 Down with five holes to play the odds were well and truly against the then 21 year old Hampshire player. However, his opponent Dylan PERRY (AUS) bogeyed four of the last five holes to let Ellis back in. On the second extra hole Perry got into trouble and Ellis was able to secure the famous trophy with another par, his seventh in a row. This was Ellis’ second major amateur victory. In 2012, aged just 16, he became the youngest player to win the English Amateur Championship. The Amateur Championship was first played in April 1885 at Royal Liverpool G.C. Allan Macfie (SCO) was the first champion beating Horace Hutchinson (ENG) 7&6 in the Final. Up until the Second World War it was a hugely prestigious event and in many of these early years was afforded a much higher standing in the game than The Open. Players like Johnny Ball (ENG), Harold Hilton (ENG) and Freddie Tait (SCO) were all amateurs and as good if not better than most of the professionals of the day. With only modest rewards available in the professional game many of the better players simply stayed amateur. The great American Bobby Jones, who won The Amateur in 1930 on the way to his Grand Slam, remains the most well known career amateur. Even after the war players remained amateur for much longer and famous names like Frank Stranahan (USA), Joe Carr (IRE), Sir Michael Bonallack (ENG) and Peter McEvoy (ENG) all built their reputations on Amateur Championship wins. With the growth and transformation of the professional game from the early 1980s onwards both the better players and the media increasingly started to turn their backs on the amateur game. Save for exceptional cases like Gary Wolstenholme (ENG) all continuity has been lost over the last 30 years and most of the young golfing stars of today rarely play any more than 2 or 3 Amateurs before being lured into the pro ranks by the huge rewards on offer. The greatest player in the history of The Amateur is Johnny Ball. The Hoylake man won the Championship a record 8 times between 1888 and 1912. Only three other players have won the competition more than twice; Sir Michael Bonallack (5), Harold Hilton (4) and Joe Carr (3). Bonallack amazingly won it three years in a row between 1968-1970. The last person to retain The Amateur was Peter McEvoy in 1977 and ’78. A great achievement and honour for all of the players listed above. However, it’s also another reminder of how incredibly tough golf is and that wins in the biggest events are no guarantee of success in the professional game. Copyright © 2015-2018, Mark Eley. All rights reserved. John MURPHY (IRE) beat Jannik DE BRUYN (GER) on the first play-off hole to win the 2018 St. Andrews Links Trophy. John becomes the third Irish golfer to win the title following in the footsteps of Alan Dunbar (2009) and Conor O’Rourke (2016). Murphy looked second favourite after his approach to the 1st hole on the Old Course ended up 25 feet away after De Bruyn had left himself just 6 feet. However, the Irishman sank his birdie putt and perhaps unsurprisingly in the circumstances the German was unable to match him. The St. Andrews Links Trust tweeted a video of the winning putt with a short interview with their winner. This was a great win for the man from Kinsale who has just completed his sophomore year at University of Louisville in the United States. He rose to 143rd in the SPWAR, jumping 616 places, as reward for the biggest win of his career. Round 4 started at 12 noon with the leaders setting off at 2.56pm. Jannik DE BRUYN (GER) shot the best final round, his second 68 of the day. Whilst his morning round had included two bogeys this afternoon he produced a clean card with four birdies. He posted 278 (-9) and waited patiently in the clubhouse to see if it would hold up. John MURPHY (IRE) also recorded the same score as he did in the morning. His 71 meant he was the only player to catch De Bruyn on -9 and that a play-off would be required to decide the winner. Jake BURNAGE (ENG) shot final day rounds of 70 and 69 to finish tied 3rd with Haydn BARRON (AUS) on 279 (-8), just one shot back. Englishman Burnage was bogey free in the afternoon but his morning 70 was something of a rollercoaster. Without wishing to be dismissive of his seven birdies it included, with the benefit of hindsight, a painful double bogey 6 on 12 and bogeys on 15 and 16. Nevertheless this represented another very good result for the Devonian No. 1 and a welcome return to form. He was the leading GB&I player in one of the world’s best amateur events. Compatriot Laird SHEPHERD finished well with a 70 to secure a tied 5th place result on 280 (-7). Gian-Marco PETROZZI (ENG) was next best for GB&I. His 281 (-6) score was good enough to secure tied 8th. Round 3 started at 7.00am with Kieran CANTLEY (SCO) going out alone. The two leading players, Laird SHEPHERD (ENG) -8 and John MURPHY (IRE) -7, teed off at 9.56am. 36 holes on the Old Course lay ahead as the 45 qualifying players set out to determine the winner of the 2018 St. Andrews Links Trophy. Joey SAVOIE (CAN) 67 and John MURPHY (IRE) 71 shared the 54 hole lead on -8. Overnight leader Laird SHEPHERD (ENG) shot 75, faltering late on with a double bogey on the 15th and a bogey on 17. Sandy SCOTT (SCO) shot the best third round score. His blemish free 66 included an eagle on the par 5 5th and birdies on 9, 12, 13 and 14. Daniel O’LOUGHLIN (ENG) also shot 67, with defending champion Matthew JORDAN (ENG) and fellow Englishman Gian-Marco PETROZZI (ENG) 68 delivering the next best GB&I scores. Jannik DE BRUYN (GER) moved up to -6 after a 68 in Round 3. The star of Day 2 was Laird SHEPHERD (ENG). The Stirling University student knows St. Andrews well and demonstrated it around the Old Course today. With a supportive wind on the way out he completed his front 9 in just 30 shots and held it together nicely on the way home. His 65 (-7) helped him move to the top of the 36 hole leaderboard on 135 (-8). There were a number of great rounds today reflecting the generally benign conditions in Fife. John MURPHY (IRE) shot 66, Christo LAMPRECHT (RSA) – winner of the East of Ireland Amateur earlier this week – 67, David HAGUE (ENG) 67, Joey SAVOIE (CAN) 67 and Jamie LI (ENG) 68, all moving into the top 10 as a result. Stuart EASTON (SCO) 67, Gian-Marco PETROZZI (ENG) 68, Therion NEL (RSA) 68 and Daniel O’LOUGHLIN (ENG) 68 all knew they needed good rounds to make the cut and impressively delivered. However, the bounceback prize has to go to Joao GIRAO (POR). After a disappointing 80 on the New Course yesterday, from which there was never going to be a way back, he at least went down fighting delivering a 66 which included 7 birdies. First round leader Olly HUGGINS (ENG) found the going harder today – his 75, and 142 (-1) total, was at least good enough to ensure he made the cut. The top 40 and ties 36 hole cut eventually fell at even par with 45 players making it through to the final day. Olly HUGGINS (ENG) leads the St. Andrews Links Trophy after an impressive 67 (-4) on the New Course. Five players, Matias HONKALA (FIN), Jake BOLTON (ENG), Luca Filippi (RSA), Tom PLUMB (ENG) and Euan WALKER (SCO), shot 68 (-3). 46 players are on Even par or better highlighting how tight the leaderboard is. 144 golfers from 26 different countries will tee off on Friday 8th June in the 30th St. Andrews Links Trophy. This event has become one of the ‘Majors’ in men’s amateur golf helped by venue and timing. The Links Trophy is a 72 hole scratch stroke play competition played over the St. Andrews Links in early June. After various National Golf Union and St. Andrews Links Trust nominations the field is determined by World Amateur Golf Ranking (WAGR) as at 3rd May 2018 rather than handicap as is normally the case. This year Round 1 will be played on the New Course – the Jubilee Course was used last year – with Round 2 on the Old Course. Following a top 40 and ties cut on Saturday the leading players will play a final 36 holes on the Old Course on Sunday. The New Course plays 6,625 yards to a par of 71. The front nine is 3,270 yards long with a par of 36 whilst the tougher back nine is 85 yards longer but with a par of 35. The Old Course is 6,721 yards off the white tees and has a par of 72. Both nines have a par of 36 and have similar yardages – the front is 3,336 yards long whilst the back is a little longer at 3,385 yards. The winner will be the player who returns the lowest 72 hole score. In the event of a tie a sudden death play-off will be held over holes 1 and 18. Ties for other places are decided by the lowest score for the last 18 holes or the last 9 or 6 or 3 or 2 or 1 hole if necessary. The 2018 St Andrews Links Trophy start sheets can be viewed here – Round 1 (New) and Round 2 (Old). The Scratch Players World Amateur Ranking (SPWAR) placed the Links Trophy 8th in its 2017 Amateur Tournament Ranking based on the strength of it’s field. It was 6th in the same ranking in 2016. 18 of the 20 members of the 2018 GB&I St. Andrews Trophy squad will be competing at St. Andrews this week. Harry HALL (ENG) and Ryan LUMSDEN (SCO) are the exceptions; both were competing in U.S. Open Sectional Qualifying today in the United States. Many of the Squad have been drawn together in the opening rounds to help the selectors follow their play closely. The attraction of St. Andrews always ensures a strong overseas entry. Australia, Canada and South Africa are particularly well represented in 2018 with Hugo BERNARD (CAN), Christo LAMPRECHT (RSA), David MICHELUZZI (AUS), Wilco NIENABER (RSA), Dylan PERRY (AUS) and Matt SAULEZ (RSA) all strong challengers. The current weather forecast appears perfect for golf – dry with minimal chance of rain. Friday 8th June – Cloudy. Wind 13 mph E. Temp. Max. 15°C / Min 9°C. Saturday 9th June – Cloudy. Wind 11 mph E. Temp. Max. 15°C / Min 10°C. Sunday 10th June – Cloudy. Wind 11 mph E. Temp. Max. 16°C / Min 9°C. Tee times in Rounds 1 and 2 start at 7.00am and end at 3.10pm so as with any links course the draw could play a big part in proceedings. The winner receives The St Andrews Links Trophy and a cheque for £500. The runner-up and third place finisher also receive commemorative medals. Reducing cash prizes are awarded to the top 10 finishers in all. In addition to the main prizes The Ian Forbes Memorial Cup is awarded for the best aggregate score on the first two days of the event. Royal Liverpool’s Matthew JORDAN won the 2017 St. Andrews Links Trophy. Following an outstanding run of form the victory almost certainly secured his place in last year’s Great Britain and Ireland (GB&I) Walker Cup team. Rounds of 70, 68, 69 and 70 took Matthew to a finishing total of 277 (-11). J.R. GALBRAITH (IRE) shot 66, 71, 70 and 71 (-10) to secure second place with Ben FERGUSON (AUS) finishing 3rd on -9. Other GB&I players to finish in the top 10 included Laird SHEPHERD (-8) 4th, David BOOTE (-8) 6th, Liam JOHNSTON (-6) 7th , Gian-Marco PETROZZI (-5) 8th and Jack DAVIDSON (-5) 9th. Only Craig WATSON (1992 and 1998), the current Great Britain & Ireland (GB&I) Walker Cup captain, and Barclay HOWARD (1994 and 1996) have won the title twice. The most famous winner is Justin ROSE who won in 1997. Interestingly given the normally cosmopolitan nature of the fields the Links Trophy has only been won by players from outside GB&I on three occasions – Australia’s Stuart BOVIER (1990), Daan HUIZING from The Netherlands (2012) and FedericoZUCCHETTI from Italy (2015). Huizing, who had won the 2012 Lytham Trophy by 11 shots just a few weeks earlier, set a scoring record of -23 in 2012 (65 New, 64, 68 and 67 all Old) and won by an astonishing 14 shots. As we come to the end of 2017 I thought I would record the more memorable performances that we have seen from Great British and Irish (GB&I) amateur golfers throughout the year. When one reads through the months below it’s hard not to conclude that the year has generally been another successful one, with many highs and just a few lows. An unusually large number of players have turned professional in the last 3 months (‘Amexit’) but I think we can take comfort from the positive signs already emanating from the next generation of players coming through. The year started with various touring parties heading off to events in the Southern Hemisphere. Evan GRIFFITH (quarter finals) and Robert MACINTYRE (semi-finals) enjoyed good runs in the Australian Men’s Amateur. Jack DAVIDSON and Conor O’ROURKE finished 4th and tied 7th at the South American Amateur in Argentina. Jack SINGH BRAR and Bradley MOORE finished 2nd and 3rd in the Avondale Amateur in Australia. Scott GREGORY delivered GB&I’s first major win of 2017, beating compatriot Marco PENGE by 1 hole in the Final of the New South Wales Amateur. Robin DAWSON (2nd), Dan BROWN (3rd), Liam JOHNSTON (5th) and Craig HOWIE (7th) made good starts to their seasons with high finishes in the South African Stroke Play Championship. Back in Europe Josh MCMAHON (2nd), Gian-Marco PETROZZI (T4), David BOOTE (T4) and Bailey GILL, George BLOOR and Tiarnan MCLARNON (T7) all showed early season form at the Portuguese International Amateur. Robin DAWSON (2nd) lost a play-off to South African star Garrick Higgo in the Cape Province Open. Stuart GREHAN and Alex GLEESON finished T4 in the same event whilst Craig HOWIE was T9. Dan BROWN (-15) was co-medalist in the South African Amateur. Dan sadly lost the play-off for the Proudfoot Trophy on the 4th extra hole albeit his second round 63 at Humewood GC will no doubt live long in his memory. He was 6-under after his first 5 holes having eagled two par 4’s. Liam JOHNSTON and Joe LONG made the Quarter-Final when the Championship match play got going. Liam JOHNSTON didn’t have to wait much longer to get his name up in lights. The following week he went on to win the African Amateur Stroke Play Championship at Leopard Creek CC. In a good week for Scottish Golf Connor SYME (2nd), Jamie STEWART (3rd) and Craig HOWIE (5th) also finished high up. Ben AMOR (ENG) turned Pro in February. Jack DAVIDSON got the European season underway by winning the Spanish International Amateur. Interestingly Jack was the final stroke play qualifier after Chris MACLEAN had pipped Stuart GREHAN to medalist honours. Nevertheless he soon got to grips with EL Saler ultimately beating Marco PENGE 4&3 in the 36 hole final. In an event with little GB&I support David HAGUE popped up with a T7 result at the Italian International Amateur. Even more surprisingly Sean CROCKER the highly rated US College golfer turned up and ended up winning the Championship comfortably by 5 shots. A superb opening day’s play from Bailey GILL, where he shot two 65’s, helped the Yorkshireman literally blow the field away at the subsequently weather shortened Darwin Salver. Scott GREGORY re-affirmed his match play credentials with an impressive 1st Extra Hole win over Australia’s 2016 US Amateur champion Curtis LUCK in the pre-Masters Georgia Cup match. WALES, represented by David BOOTE, Jack DAVIDSON, Joshua DAVIES and Owen EDWARDS, won the European Nations Cup Team competition at RCG Sotogrande in Spain. WALES’ total of +13 was 11 shots better than second placed IRELAND (+24) and 21 shots better than fourth placed SCOTLAND (+34). An out of sorts ENGLAND (+61) finished a disappointing 12th. Jack DAVIDSON won the Individual European Nations Cup title by 4-shots. Rounds of 70, 70, 70 and 73 (-5), which included 20 birdies and 2 eagles, gave him his second major title in less than a month. Charlie STRICKLAND, who was runner-up to Bailey GILL at the Darwin Salver, then came to the fore, winning two 72 hole events in consecutive weeks. First came the Duncan Putter – which will be moving to three days at Southerndown in 2018 – and quickly following it up with the U18 Peter McEvoy Trophy at my home club, Copt Heath. The 2016 US Mid-Amateur champion, Stewart HAGESTAD, won the Silver Cup at The Masters following rounds of 74, 73, 74 and 73 (+6). His tied 36th finish saw him comfortably win low amateur honours. Our Amateur champion, Scott GREGORY, missed the cut after rounds of 82 and 75 (+13). The Scottish Boys Open Championship, disappointingly scheduled directly against the Peter McEvoy Trophy, was won in style by John PATERSON who came past runner-up Jamie STEWART at Monifieth with an exceptional final round of 67. The Hampshire Salver again proved a popular weekend for competitors. Jack SINGH BRAR won Saturday’s Selborne Salver and Jake BURNAGE Sunday’s Hampshire Hog at North Hants. Singh Brar beat Burnage by 1shot for the combined 72 hole Hampshire Salver. Up in Scotland Craig HOWIE, the clear favourite at the start of play, dominated the Craigmillar Park Open shooting rounds of 66, 66, 66 and 67 (-15) and winning by 8 shots. Barry ANDERSON won the West of Ireland Amateur Open Championship at County Sligo beating Jack PIERSE 3&2 in the Final. Earlier Conor O’ROURKE had edged out fellow Naas member Jonathan YATES to secure medallist honours in the 36 hole stroke play qualifier. Chile’s Joaquin NIEMANN started his rise to the top of the Men’s World Amateur Golf Ranking by winning the prestigious Junior Invitational at Sage Valley in the United Sates. Owen EDWARDS (-3) won the West of England Stroke Play after a strong final day’s play at Saunton left him as the only player under par. David HAGUE (+1) was 2nd and Will POOLE (+3) tied 3rd. On the same weekend Connor SYME won the Battle Trophy at Crail. Despite giving the field a chance with a final round 79 the Drumoig man still won by 5 shots. Meanwhile in South Wales Matthew HARRIS won the Carmarthenshire Open at Ashburnham and Callum MORRIS the Golden Eagle at Tenby. However, it was Luke HARRIES who won the Trubshaw Cup for the best 72 hole score over the weekend. May saw the focus return to Great Britain and Ireland with our leading amateur events now starting to be played. Jack SINGH BRAR won the Lytham Trophy helped in no small part by a superb first round of 68 achieved in strong winds when the rest of the elite field struggled (CSS 79). Charlie STRICKLAND and Jake BURNAGE finished 2nd and 3rd in what proved to be a very good week for England Golf with 7 of the top 10 coming from the home nation. Just down the road George RAITT and Conor GOUGH finished 2nd and tied 3rd respectively in the Boys’ Fairhaven Trophy. However, Sweden’s Ludvig ABERG was in a class of his own that week winning by 9 shots. Having come close in the West of England a few weeks’ earlier Will POOLE found Kent’s links courses even more to his liking winning the South East of England Links Championship. Peter O’KEEFFE won the Irish Open Amateur Championship holding off a strong field at Royal County Down GC. A posse of English and Scottish players made Peter work for it with Chris MACLEAN and Tom SLOMAN ultimately finishing 3 shots back in tied 5th. David HAGUE won the Lagonda Trophy by 12 shots. An astonishing 62 63 final day finish on the 6,367 yards par 70 Old Course blitzing the field. Josh HILLEARD won the Murat Cup at the French International Amateur beating the home junior Pierre PINEAU on the second play-off hole. Both players came through the field in the final round of the 72 hole contest at Chantilly; Hilleard shooting 64 and Pineau 66. In what proved to be a successful weekend for England Golf Gian-Marco PETROZZI secured the Welsh Amateur Open Stroke Play title at The Vale Resort. Gian-Marco (-13) won by 9 shots from fellow Staffordshire player Jack GAUNT (-4) and local favourites Jack DAVIDSON (-3) and Owen EDWARDS (-1). Woodhall Spa staged the 2017 Brabazon Trophy with South Africa’s Kyle MCCLATCHIE beating Jamie STEWART, Jake BURNAGE and Jack SINGH BRAR by 1 shot to secure the prestigious English Men’s Open Amateur Stroke Play title and beautiful gold plated trophy. In what proved to be a generally disappointing US Collegiate season for GB&I players Braden THORNBERRY won the NCAA Division 1 Individual Stroke Play before OKLAHOMA secured the Team title in the subsequent Match Play stage. Sam HORSFIELD (ENG) turned Pro in May 2017. June started with England’s Max MARTIN picking up the Welsh Open Youths Championship at Prestatyn. Liam JOHNSTON won the Scottish Men’s Open Championship at Western Gailes, holding off an in form Matthew JORDAN (2nd) by 2 shots and fellow Scottish Internationals Craig HOWIE (T3) and Connor SYME (5th). The East of Ireland Amateur went to Reece BLACK whose final round 66 at County Louth was needed to hold off a fast finishing Robbie PIERSE (69). Matthew JORDAN finally got the win his outstanding play in May and June deserved when he picked up the St. Andrews Links Trophy. Two late bogeys on the Old Course from Matthew enabled Ireland’s John Ross GALBRAITH, who birdied two of his last four, to finish 1 shot back, making the result tighter than it really should have been. Somewhat ominously, given September’s Walker Cup match, USA ran out easy winners against Europe in the Arnold Palmer Cup played at the Atlanta Athletic Club. Driven on by unbeaten Doug GHIM, with Maverick MCNEALY, Collin MORIKAWA and Norman XIONG all featuring, USA won easily 19.5 – 10.5. The Arnold Palmer Cup match moves to a new mixed format in France next July. One of the highlights of the year was Harry ELLIS’ magnificent win in The Amateur Championship staged at Royal St. George’s and Princes in Kent. 4 Down with five holes to play Ellis somehow fought back, helped in no small part by Dylan PERRY bogeying four of these remaining holes. The Hampshire man ultimately won on the second extra hole when the Australian could do no better than a 6 on the par 4 2nd hole. The win secured Harry his place in history but also this year’s Open Championship and the GB&I Walker Cup team. With a trip to Augusta National in April 2018 still to come it really is the Championship that keeps on giving. A quick word also for medallist Caolan RAFFERTY whose 62 on Day 2 at Prince’s, even with a bogey on the last, was one of the amateur stroke play rounds of the year. Ben JONES won the U18 Boys Sir Henry Cooper Masters by 10 shots at Nizels G&CC, separating himself from his peers after a 9-under, bogey free, 63 in round 3. In a stellar year for the competition the outstanding Lily May HUMPHRIES won the Girls event by 12 shots. The 2017 Berkshire Trophy was won by Adam LUMLEY who finished on -18, 7 shots ahead of JACK CLARKSON. David HAGUE and Billy MACKENZIE finished tied 3rd. Mark POWER retained his Irish Boys Amateur Open Championship title at Castleroy GC, the first person to do so since Paul Dunne a few years ago. He and England’s Jack COPE finished on -5 before Mark ended a topsy-turvy three hole play off in style by holing a 129 yard wedge on the 18th. Kevin LE BLANC (IRE) turned Pro in June. July 1st saw Alfie PLANT memorably win the European Men’s Amateur at Walton Heath GC. A near tap-in birdie on the 72nd hole helped the man from Kent draw level on -15 with Lorenzo SCALISE and defending Luca CIANCHETTI, helped in no small part by both Italians bogeying the same hole. With a place in The Open Championship on the line Plant went on to birdie the Old Course’s 2nd hole, winning the sudden death play off on the fifth extra hole. Greg DALZIEL won the Scottish Boys Amateur Championship at Scotscraig, beating Australian-based Josh GREER by 1 hole in the Final. A week later The Scottish Boys U16 Open Championship at Fairmont Kittocks went to 13 year old Calum SCOTT, younger brother of Scottish Men’s International Sandy. Josh GREER finished tied 2nd four shots back. Equally of note were the 7th and tied 12th place finishes of Max HOPKINS and Aidan O’HAGAN, new names that would come to mean more as the year unfolded. The North of Ireland Championship was played at Royal Portrush GC with Caolan RAFFERTY winning the stroke play qualifier on -10. Caolan fell to Colin FAIRWEATHER in the semi-finals before Rowan LESTER beat Colin by 2 holes in the final. DENMARK won the European Boys Team Championship at La Manga beating SPAIN 4-3 in the Final. ENGLAND (T4) and IRELAND (8th) both qualified for Flight A but found little success in their three matches. ENGLAND (1st), SCOTLAND (5th) and IRELAND (6th) all made Flight A in the Men’s European Amateur Team Championship which was played concurrently with the Boys’ at Diamond CC in Austria. In a closely fought match SPAIN beat ENGLAND 4-3 in the final. Estonia’s Joonas TURBA was something of a surprise winner at the MacGregor Trophy (Boys’ U16 Open Amateur Stroke Play Championship). English propsects Max HOPKINS and Robin WILLIAMS were second and third respectively. Noah GOODWIN (USA) beat Matthew WOLFF (USA) 1Up in the final of the US Junior Amateur at Flint Hills National GC in Kansas. 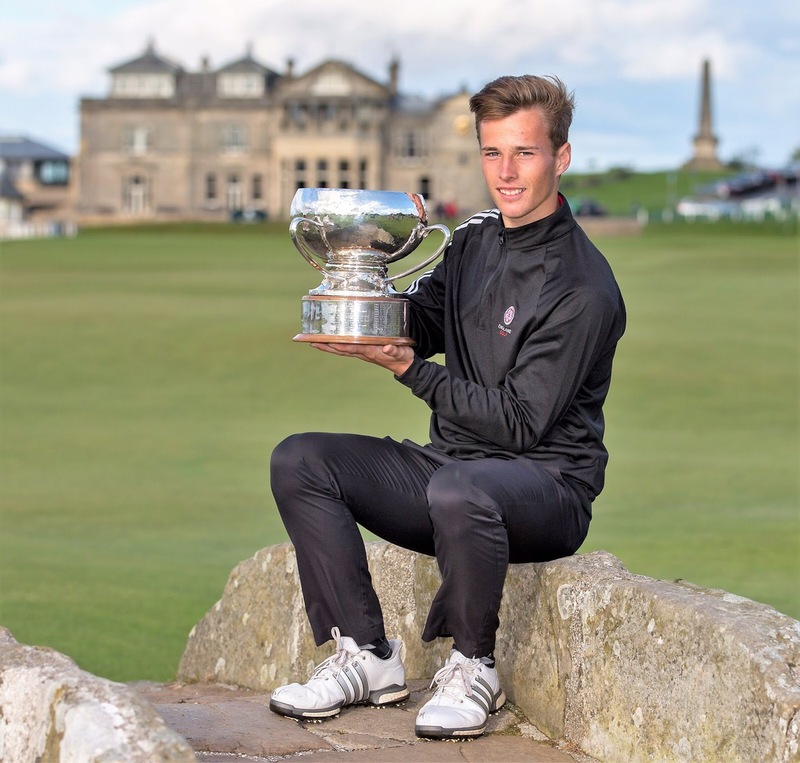 Alfie PLANT collected the Silver Medal for the low amateur at The Open Championship after rounds of 71, 73, 69 and 73 (+6) secured a T62 at Royal Birkdale GC. Connor SYME (73 76, +9) and Harry ELLIS (77 75, +12) both missed the cut. Jake BURNAGE beat a fast finishing Jack YULE to win the South East of England Amateur Championship played on the New and Old Courses at Walton Heath GC. The Club have recently announced that the event will be renamed as The Walton Heath Trophy from 2018. Andrea ROMANO from Italy beat France’s Jean BEKIRIAN in a play-off to secure the Carris Trophy (Boys’ U18 Open Amateur Stroke Play Championship). English trio Jack COPE, Taylor STOTE and Robin WILLIAMS all finished in the Top 5 at West Sussex GC. Conor GOUGH (-5, 7th), Barclay BROWN (+1 T14), Lily May HUMPHRIES (-2, 1st) and Annabell FULLER (Ev, T3) collectively won the Team title at the European Young Masters with a -12 total score in Oslo. The 2017 South of Ireland Open Championship was won by James SUGRUE at Lahinch. After the North champion Rowan LESTER had won the 36 hole stroke play qualifier James worked his way through a strong field before beating Conor O’ROURKE 3&2 in the final. Evan GRIFFITH dominated stroke play qualifying in the Wales Amateur Championship at Aberdovey GC with two rounds of 68 and 64 (-10) seeing him achieve medalist honours by an impressive 6 shots. However, Wales’ player of the year Jack DAVIDSON got the better of him in a tight semi-final before going on to beat Tim HARRY in the 36 hole final by 8&7. The Scottish Amateur was played at Prestwick and was won by Sam LOCKE. Sandy SCOTT and Calum FYFE were the leading qualifiers. LOCKE played superbly in the match play stage ultimately beating Ryan LUMSDEN 9&8 in the 36 hole final. The English Men’s Amateur was contested at The Berkshire. The story from the stroke play stage was medalist’s David LANGLEY’s superb 61 on the Blue Course on Day 1. However, it was Todd CLEMENTS who prevailed in the match play eventually beating Jack GAUNT 2&1 in the final. Like the Brabazon Trophy earlier in the year it was a South African who won the Reid Trophy, awarded to the winner of the English Boy’s U14 Open Amateur Stroke Play Championship. Casey JARVIS (-4) held off fast finishing Spaniard Jose BALLESTER at the Manchester GC. For those looking for potential GB&I stars of the future Rory MCDONALD-O’BRIEN (ENG), George DURKAN (ENG), Joshua HILL (IRE), Joseph BYRNE (IRE) and Jack BIGHAM (ENG) all finished in the top 10. ENGLAND won The Boys’ Home Internationals at St. Anne’s Old Links. Toby BRIGGS, Conor GOUGH, Joe PAGDIN and Robin WILLIAMS all compiled W5 L1 H0 records during the week. Whilst SCOTLAND came last they did provide the highlight of the week; the unbeaten foursomes pairing of 13 year olds Calum SCOTT and Aiden O’HAGEN. Andrew WILSON (-4), the only player to finish under par for the 72 holes and helped on his way by a 62 in round 1, won the Lee Westwood Trophy at Rotherham GC. Charlie THORNTON and Olly HUGGINS (Ev) were tied 2nd. IRELAND continued their superb run at the Men’s Home Internationals winning the Raymond Trophy for a fourth consecutive year at Moortown GC in England. Caolan RAFFERTY (W5 L1 H0), Paul MCBRIDE (W4 L0 H1) and Colin FAIRWEATHER (W4 L1 H0) starred in a strong team performance. The 2017 Boys’ Amateur Championship was played at Nairn GC and Nairn Dunbar GC. Home player Darren HOWIE (-8) was medallist with Alex FITZPATRICK (-7) tied 2nd and Danny DANIELS (-6) tied 4th. However, it was Portugal’s Pedro LENCART SILVA, who had qualified in tied 6th on -4, who came through the match play stage to win. He beat defending champion Falko HANISCH (GER) 5&4 in the 36 hole final. Played at the magnificent Riviera CC and Bel-Air CC’s in Los Angeles Doc REDMAN won the U.S. Amateur Championship in stunning fashion. Hayden WOOD (-9) achieved medallist honours in the stroke play qualifying. Jack SINGH BRAR (-2) T8 led the way for GB&I, with Connor SYME and Robert MACINTYRE (both +2) T35 following him into the match play stage. Syme went furthest at Riviera ending up losing 2&1 in the quarter finals to Doug GHIM. Ghim went on to reach the final where he found himself 2Up with two to play and just over the back of the green in two on the par 5 17th. With Redman just on the green in front of him easily 50 yards away from the hole he could be forgiven for thinking the Havemeyer Trophy was his and for allowing his mind to wander to the first tee of Augusta National in April 2018. Unfortunately the golfing gods stepped in. After Ghim had left his chip 6 feet short Redman stepped up and at pace holed the most amazing right to left downhill putt of the year, or for that matter almost any year, for eagle. Redman then followed it up with a superb birdie on the uphill 18th from 6 foot with Ghim only managing a scrambled par. With the match now All Square, Redman hit a perfect drive to the front of Riviera’s short 315 yard par 4 10th, the first extra hole. Visibly shocked at what was happening in front of him Ghim then hooked his drive and having hacked around for a while before securing a 6 conceded Redman the Championship. An unbelievable finish to amateur golf’s premier event. The North of England U16 Boy’s Championship was won by Callum MACFIE at Pannal GC. Matthew JACKMAN was one back with Max HOPKINS a little further back in 3rd place. The Irish U16 Boys Amateur Open Championship was played at Rockmount and was won by Mullingar’s Adam SMITH. Odhran MAGUIRE, the younger brother of Leona and Lisa, was 2nd. Down at Sundridge Park GC Liam BURNS (-5) defenced the Waterford Trophy. A 67 66 final day finish was required by the man from Chiselhurst to hold off Nick PANTING by 1 shot. The U16 Welsh Boys was won by Bryn THOMAS at Cradoc GC. Thomas’ final round of 67 helped him to a 9 shot victory over Tom PEET. The Irish Amateur Close Championship was won by Jamie FLETCHER at Galway GC. Peter KERR and David BRADY were seeded 1st and 2nd after both recorded 138 (-2) in the stroke play stage. In a tight 18 hole final Fletcher beat David KITT by 1 hole. Richard MANSELL (ENG), Bradley MOORE (ENG), Marco PENGE (ENG) and Sean TOWNDROW (ENG) all turned Pro in August. The CONTINENT OF EUROPE won the annual Jacques Léglise Trophy U18 Boys’ match against GB&I at Ballybunion GC by 15.5 – 9.5. Unbeaten pair Pedro LENCART SILVA (W3-L0-H1) and Eduard ROUSARD SABATE (SWE) helped the away side to a second successive win. Ben JONES (W2-L1-H1) and Robin WILLIAMS (W2-L1-H0) put up the best defence for GB&I. The Walker Cup result was an even more sobering experience for GB&I the following week. Craig WATSON had to step down as GB&I captain on the eve of the match but with Andy INGRAM a very capable deputy I am sure this in no way contributed to what followed at Los Angeles Country Club. Whilst the final result was not unexpected the manner of the 17-9 defeat was. Only Jack SINGH BRAR (W3-L1-H0), Robert MACINTYRE (W1-L1-H1) and Scott GREGORY (W2-L1-H1) really came away with any credit from the match. From the USA side Captain Spider Miller had clearly learned a few lessons from Royal Lytham in 2015 and backed up by superb performances from Doug GHIM, Maverick MCNEALY, Colin MORIKAWA, (all W4-L0-H0) and Norman XIONG (W3-L0-H1) the one sided result felt inevitable as soon as the Day 1 singles were concluded. Ben JONES won The Duke of York Champions Trophy at Royal Liverpool GC by 8 shots from Sweden’s Oscar TEIFFEL. John PATERSON, who shot a 69 in round 2, the best of the week, finished 7th. David BOOTE (WAL), Dan BROWN (ENG) Jack DAVIDSON (WAL), Tom GANDY (ENG), Scott GREGORY (ENG), Evan GRIFFITH (WAL), Cameron LONG (ENG), Alfie PLANT (ENG), Craig ROSS (SCO), Conor O’ROURKE (IRE), Jack SINGH BRAR (ENG), Connor SYME (SCO), Will WHITEOAK (ENG) and Jack YULE (ENG) all turned Pro in September. David HAGUE (+1) won the North of England Amateur Open Stroke Play Championship at Alwoodley GC. Andrew Wilson (+3) was 2nd with Harry GODDARD and Nick POPPLETON (+4) tied 3rd. Joshua DAVIES (WAL), Owen EDWARDS (WAL), Colin FAIRWEATHER (IRE), Stuart GREHAN (IRE), Liam JOHNSTON (SCO) and Robert MACINTYRE (SCO) all turned Pro in October. A birdie, eagle finish helped China’s LIN YUXIN to the Asia-Pacific Amateur Championship title at Royal Wellington GC in New Zealand. We can therefore look forward to seeing him in action at The Masters in 2018. 14 year old Max HOPKINS (-2) became the youngest ever winner of the Boys’ Telegraph Vitality Junior Golf Championship at Quinta do Lago in Portugal. Ben JONES (+1) was 2nd and Alfie FOX (+3) 3rd. Jamie CLARE (ENG), John Ross GALBRAITH (IRE) and Chris MACLEAN (SCO) all turned Pro in November. Sam HORSFIELD won the Final Stage of the European Tour Qualifying School at Lumine Golf & Beach Club in Spain. His final -27 score, with all six rounds in the 60’s and a best of the day final round of 63 (-8), saw him win the 108 hole event by an impressive 8 shots. Amongst the other players to pick up a 2018 Tour card were Connor SYME, who finished tied 9th on -17 and Jonathan THOMSON, who finished tied 18th on -14. Ben JONES (-12) finished tied 2nd at the South Beach International Amateur in Miami. In an event which enjoyed the 5th strongest field of the year it was also pleasing to see Harry HALL (-7) and Joe PAGDIN (-4) record impressive results; tied 10th and tied 19th respectively. Ben JONES finished tied 28th at the Boy’s Junior Orange Bowl Championship in Miami, 22 shots behind runaway winner Jerry JI from The Netherlands. Lily May HUMPHRIES enhanced her growing reputation by winning the Girls event by 9 shots. Mason OVERSTREET (USA) won The Patriot All-America in Arizona. The six GB&I players struggled to make an impression with George BURNS (T38) recording the best finish. Josh HILLEARD (ENG) turned Pro earlier in the month. 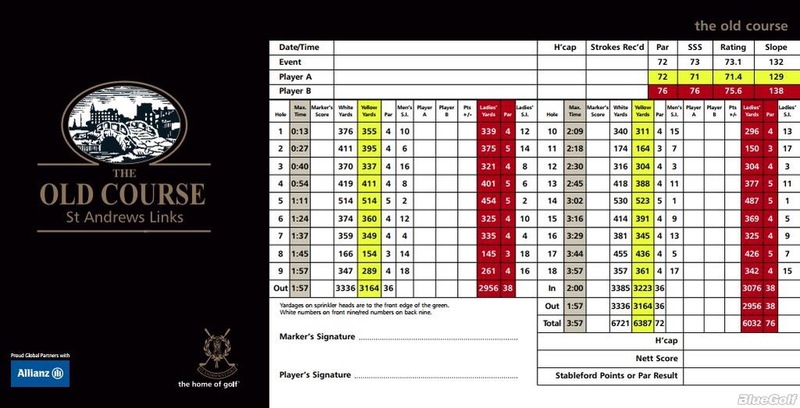 If you want to review the detailed results of any of the above competitions then please take a look at the GolfBible Results Page where you will be able to find links to nearly all of those mentioned above. Copyright © 2017, Mark Eley. All rights reserved.